From aircraft refueling hose to garden hose, from metal hose to cloth covered hose, JGB is expert at addressing any of your hose needs. Our expertise goes beyond just selling hose and hose accessories. Here at JGB we can design and custom fabricate hose assemblies for any application. We are on the Qualified Provider List (QPL) for many of our assemblies. In this category you will find some of the hoses that JGB handles so frequently we consider them our Specialty Hoses. JGB offers Aircraft Fueling and Defueling Hoses for commercial and private aircraft. Used for handling jet fuel and higher aromatic aviation gasolines, their high working pressure permits use in fuel cart hydrant service. JGB supplies Fire Engine Booster Hose and complete hose kits for use in fire service. Unlike lay flat hoses, these thick-walled, small diameter, high-pressure hoses keep their round profile even while being carried on reels. They are designed for fighting small fires without having to connect to a fire hydrant. Fire Engine Booster Hose also has many applications in other heavy-duty industrial and municipal operations. JGB supplies high grade Pressure Wash & Water Hoses for any wash down application. Our customers can choose hose from 1/4 to 3/4 inch diameter, yarn or steel wire reinforced hose that can handle working pressures from 150 to 6000 psi. Our pressure washer hose comes in lengths up to 100 feet but is also available in custom lengths. These water hoses come with solid brass fittings in lengths up to 100 feet. JGB offers the Avalanche® 200 Snowmaking Hose, a premium quality double jacket snow hose with a high-performance construction that gives superior abrasion resistance and longer life even in the most severe applications. This hose is resistant to most chemicals, petrol products, ozone and UV exposure, as well as rot and mildew, and has excellent cold flexibility down to -65°F (-55°C). Water Blasting is an environmentally friendly alternative to sand blasting, shot blasting and other methods of removing old materials. JGB offers a line of high quality water blast hose including our new Eagleblast hoses. All of our hoses are 100% tested and certified. We are also a member of the WJTA - WaterJet Technology Association. JGB has a large inventory of standard Airless Paint Spray Hose Assemblies in stock including our own EZ Kote® Airless Paint Spray Hose Assembly recommended for applications where an electrostatic charge must be eliminated. We also carry many other paint transfer hoses and tubing with lower working pressures to satisfy all your paint spray needs. JGB specializes in the supply of Petroleum Hoses for military, industrial, and commercial applications worldwide. From Liquid Propane hose to Farm Pump hose, JGB is your one-stop shop for any type of petroleum hose! Our engineering, technical, and manufacturing staff will determine what to use in meeting your, gas, fuel, diesel, aviation suction and pressure application hose needs. JGB Enterprises supplies Sanitary Food and Dairy Hoses and Fittings that meet FDA and USDA standards for the pure transfer of solids and liquids. We've eliminated contaminating events such as leaks, blown couplings or rust, and our delivery systems will not discolor foods or leave behind a rubbery taste. Each part is tested to provide the highest level of quality and is then permanently labeled and certified for trace ability. 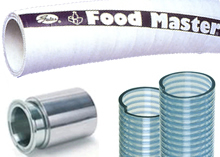 We have a complete line of sanitary delivery systems for every application. JGB Enterprises, Inc. carries Hydraulic Hoses in the sizes, lengths & vacuum ratings for any low to high-pressure apparatus. Most of our hoses come with a choice of covers depending on usage conditions. Along with our bulk hose, JGB custom assembles hydraulic hose in many variations. We also carry hydraulic fittings, adapters, and couplers to work with any type of machine. JGB offers Hot Air® Transfer Hose for conveying hot air up to 400°F from a blower or compressor to tanks on dry bulk material carriers. The hose tube and cover are constructed of black EPDM rubber. The hose has multiple plies of high tensile textile with dual steel wire helix reinforcement for strength. JGB Eagle Bulk® Material HD Hose (Frac Sand Discharge Hose) is a material handling hose used for the pneumatic transport of abrasive materials such as cement, sand and other dry abrasive bulk materials. Its anti-static tube liner compound makes this hose a great choice for the anti-static transfer of materials that create static buildup. JGB Eagle Air® Wire Reinforced 600# Hose (Bull Hose) is a long-lasting, heavy-duty air hose with wire reinforcement for use in mines, construction and industrial applications where maximum service is required. It is ozone and abrasion resistant, and features a high degree of safety against bursting. It has a working pressure of 600 PSI and a burst pressure of 2320 psi. JGB Eagle O.S. & D.® Hose is an oil suction and discharge hose for delivery of oil or water. It has a working pressure of 250 psi and the nitrile tube is reinforced with multiple high tensile synthetic tire cords with round steel wire helixed in rubber. The synthetic rubber cover resists oil, weather, and ozone. JGB's Eaglecrete® Concrete Pumping Hose comes in 1233 or 1300 psi working pressures. It is constructed with a black conductive natural rubber tube and NR/NBR blend cover. The Eaglecrete® 1233 is reinforced with spiral textile while the Eaglecrete® 1300 is reinforced with a spiral wire. Heavy-Duty, Vic, NPT and Metric coupling configurations are available with this hose. JGB's Eagle FlexCrete Mortar TPU Hose is a lay flat concrete boom tip hose ideal for ICF forms, columns and tall walls where space is at a minimum. It meets or exceeds ASME requirements. This hose is operator friendly and features ease of pour in tight areas. It has a more consistent flow at lower placement rates and comes in bright yellow for visibility and safety. JGB's Eagle FlexCrete is a layflat concrete pump hose that is lightweight and easy to maneuver making it perfect for pouring concrete in tight areas. This hose is 1/3 the weight of a standard boom hose. This Water Hose is the lightest and strongest layflat industrial water hose on the market. 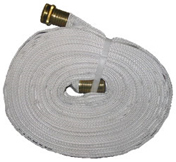 This hose is perfect for use as a washdown hose, to put out grass fires, or as a heavy-duty garden hose. It is available with standard brass threaded garden hose fittings or optional NHT fittings. JGB offers Omegaflex® Flexible Metal Hose in corrugated and braided styles. JGB also offers a full range of metal hose assembly fabrication services for low, medium, and high pressure applications. Ideal for use in rough outdoor conditions, Transporter Vapor-Lock Tank Truck Hose is unlike any other bulk transport hose product available today due to an exclusive manufacturing process that makes this hose the most environmentally friendly vapor barrier hose available. 90-99% of lost fuel/petroleum atmospheric emissions are reduced resulting in a hose that pays for itself in fuel saved through this new technology. 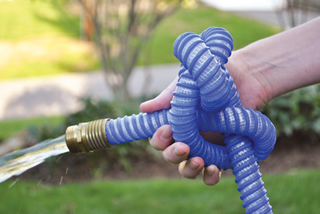 The Perfect Garden Hose® is ideal for residential and light commercial users. The hose is as suited for washing your car, RV, or boat as it is for wash-down use in industrial plants, horse barns, and landscape applications. 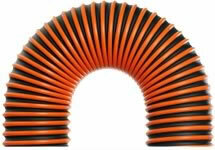 JGB presents the Lawn and Leaf Collection Hose: the heavy duty, drag resistant RFH-W; the lightweight, drag resistant TBH-W; the heavy duty, abrasion resistant UFD.045; the smooth interior, all-plastic UFD-AP. JGB Enterprises supplies Hydro-Seeding Hoses for grass, leaf, twigs, bark, mulch and other materials handling applications. Heated Hoses work in below-freezing temperatures. The heated hoses maintain a discharge or sewage water line 24/7 throughout the winter or use for periodic tasks.